Boosting intra-African trade and deepening regional integration offer an effective channel to speed up Africa’s economic transformation. Higher volumes of intra-African trade in agricultural products and the elimination of non-tariff barriers have the potential to boost industrialization and enhance competitiveness, at country and industry levels, through higher investments in connectivity and infrastructure, both physical and digital. Favourable policies to enhance intra-regional trade on the continent such as the ongoing Continental Free Trade Area (CFTA) and the Tripartite Free Trade Agreement (FTA) will be crucial to building a single continental market for goods and services, along with free movement of labour and capital as well as greater harmonisation in standards and procedures. The Continental FTA will have a combined GDP of about $2.3 trillion and a population of more than 1.2 billion people, with more than half comprising the youth. It will open up the continent to new investors and better opportunities for its entrepreneurs. Given the amounts spent on imported food, the demographic changes taking place, the huge opportunities offered by urban markets across the continent not to mention the immense productive potential for agriculture in Africa, it is evident that there are both significant opportunities and a pressing need for greater intra-African and intra-regional agricultural trade. In order to maximise the benefits of regional integration and look for new opportunities for agricultural competitiveness, policymakers, the private sector and development partners need access to accurate, comprehensive and reliable data on intra and inter-regional agricultural trade in Africa. 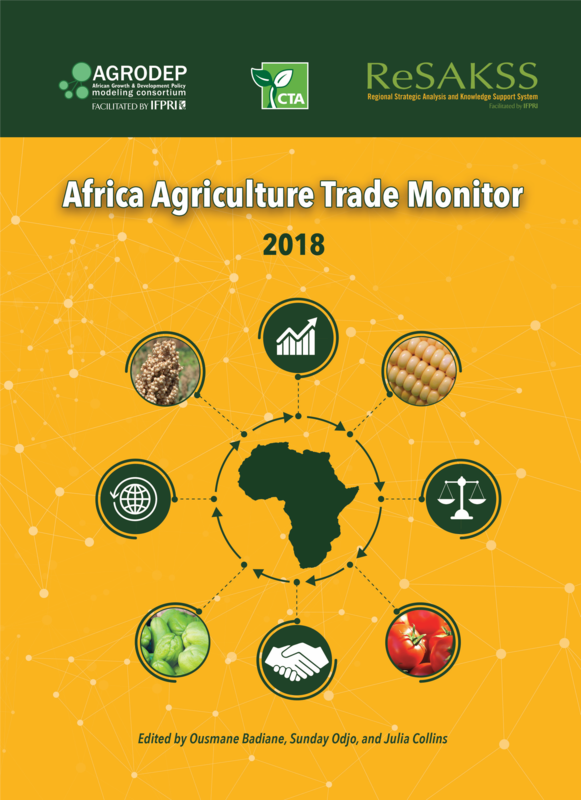 Building upon our previous work on regional trade in Africa, we are pleased to launch the 2018 Africa Agriculture Trade Monitor (AATM). The Report is the fruit of a collaboration between the International Food Policy Research Institute (IFPRI) and the Technical Centre for Agricultural and Rural Cooperation (CTA). It builds on the work by the Regional Strategic Analysis and Knowledge Support System (ReSAKSS) and the African Growth and Development Policy Modelling Consortium (AGRODEP) trade, both facilitated by IFPRI under its work in support of the African Union Commission’s Comprehensive Africa Agriculture Development Programmes. The 2018 edition of the AATM examines the status and trends in competitiveness of African countries in global as well as intra-African agricultural markets. The report also analyses key determinants of trade performance among African countries, as well as opportunities to expand intra-trade within regional blocks and at the continental level. The report makes an important contribution towards the data and analysis needed to advance efforts to promote intra-African trade and better integrate agricultural markets across the continent. This report reflects IFPRI and CTA’s commitment to advancing knowledge and sharing of best practices relating to agricultural trade in Africa. We hope it will generate great interest and use of the data and findings by policy-makers and practitioners. Trade and regional integration have dominated the political agenda in recent years, with scores of countries pursuing trade agreements under various configurations. There is a renewed focus on the role of the private sector, and on reducing and eliminating trade barriers in order to boost economic growth by encouraging more trade and investment. The nexus between trade, integration and development is recognised to hold immense potential for sustainable growth and poverty reduction, and provides opportunities for enhancing the welfare of producers and consumers, provided that governments are able to develop and enforce policies to this effect. Under the framework of the 2030 Agenda for Sustainable Development, the role of trade in achieving the Sustainable Development Goals is recognised in a number of areas. Target 2.b of SDG2 calls for the correction and prevention of trade restrictions and distortions in world agricultural markets, whereas targets 17.10 to 17.12 of SDG 17 also highlights the importance of trade, particularly for the least developed countries. This panel will provide an overview of the main trends in inter and intra-regional trade in Africa and the main drivers of success. This panel will look at specific examples of successes in the implementation of regional trade agreements and will bring various perspectives, including the private sector.